Losing a Pet is never easy. Creating Engraved Pet Memorial Personalized Wood Picture Frames would leave you with nothing but great memories. Engraving your own personal special message on the frame will truly give the frame meaning. 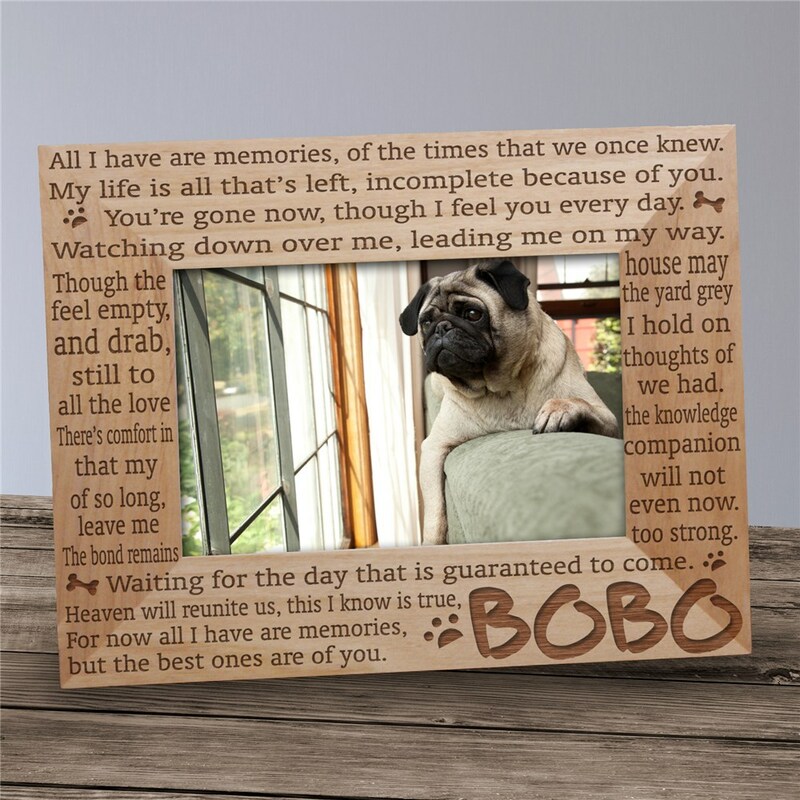 These charming personalized wooden picture frames feature a beautiful poem dedicated to your pet. Our Personalized Pet Memorial Wood Picture Frame is available in three different sizes. Please choose from 4"x6", 5"x7" and 8"x10". Easel back allows for desk display. Our Engraved personalization features a natural wood grain color. Our Pet memorial frame also includes FREE Personalization! Personalize your Pet Memories Picture Frame with any pet's name. All I have are memories, of the times that we once knew. My life is all that's left, incomplete because of you. You're gone now, though I feel you every day. Watching down over me, leading me on my way. Though the house may feel empty, the yard grey and drab, I hold on still to thoughts of all the love we had. There's comfort in the knowledge that my companion of so long, will not leave me even now. The bond remains too strong. Waiting for the day that is guaranteed to come. Heaven will reunite us, this I know is true, For now all I have are memories, but the best ones of you. It was so cute!! I got it for a friends whose dog had recently passed and he loved it. It was perfect! It was a memorial gift for a dear friend and she absolutely loved it. My sweet Beagle, Daisy recently passed away. I have purchased an engraved personalized frame for each of my fur kids as they pass. I now have three hanging on my wall. These frames are very well made, and the engraved poems and pet's name are perfect. Thank you for giving me a great way to remember my dearly departed pets. GiftsForYouNow.Com has a large selection of Personalized Pet Lover Photo Frames to help you cope with the loss of your furry friend. Choose from different gifts like our Engraved Dog Memorial Glass Frame and our heart warming Picture Perfect Pet Photo Canvas as well. Each memorial piece we offer is sure to honor your loving pet and will remind you of those precious moments spent together.